The Component Diagram is one of the Unified Modeling Language Structural diagrams that can be used to model the logical components that make up a system. They can be used to model the applications of an organization including their Provided and Required Interfaces and the information that is exchanged between the interfaces. Component hierarchies can be created that show how top levels systems or applications are broken down to lower level Components. The Components can be given a name, detailed descriptions can be added and additional properties can be added using Tagged Values. 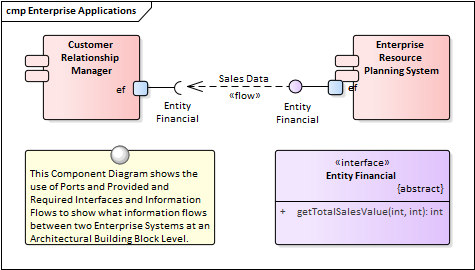 The Component Diagram can be used to model logical or physical parts of a system including current and future state Components. Application Architectures often use a number of Component Diagrams to describe the architecture of the applications and how they interact. The interaction between the applications can be shown using a combination of Ports and Provided and Required Interfaces that describe how the Components are wired together. Component Diagrams can be drawn at a number of levels of formality from simple diagrams that show the dependencies between Components to sophisticated diagrams using Ports, Interfaces and Information flows. 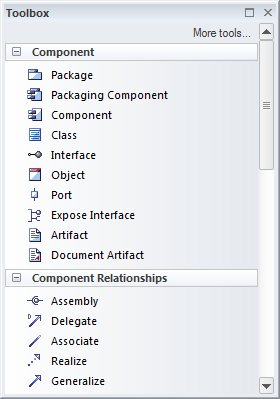 There is a toolbox which contains a range of elements, relationships and Patterns for creating Component diagrams. The Component Diagram (like any diagram) can be viewed as an element list that makes working with the element's properties easier. Diagram Filters can also be used when presenting the diagrams, to draw attention to parts of the diagrams, and the diagrams can be presented as hand drawn or in a whiteboard style by changing the properties of the diagram.